Some places have a way of leaving an impression that lasts long after you’ve gone home - the Adelaide Hills, SA, is one of them. From the spectacular views from Mount Lofty Summit to the quaint town of Hahndorf and its remarkable German history, the awe-inspiring scenery in Morialta Conservation Park and the many award-winning wineries, this stunning region is sure to take your breath away. Amazingly, this picturesque area is only a hop and a skip from South Australia’s bustling capital city. Yet, it has a distinct country feel which contributes to its wide appeal. Driving up the Mount Lofty Ranges, the winding roads and rolling hills make you feel as if you’re far away from any large city. Yet, when you reach the car park near Flinders Column and walk out to the giant white obelisk, you’re greeted by panoramic views of Adelaide’s skyline and beyond. 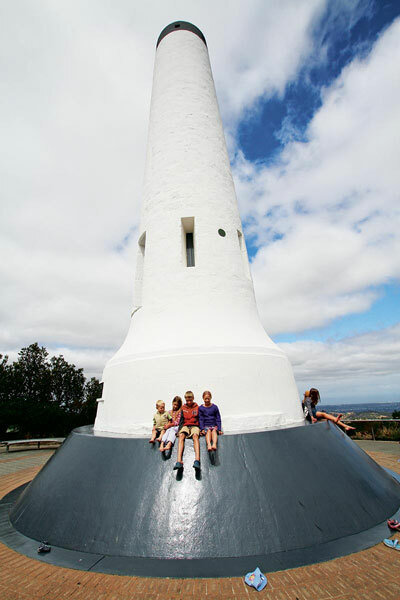 Today, Mount Lofty Summit boasts a visitor information centre and gift shop as well as a restaurant and cafe. A short distance away, the Cleland Wildlife Park is popular with children and international visitors, providing the opportunity to meet some 130 species of Australian wildlife. Koalas, kangaroos, emus, echidnas, wombats, dingoes and potoroos are some of the natives that roam freely throughout this fantastic park. It is also possible to cuddle a koala here – although an additional fee applies. A trip to the Adelaide Hills is not complete without experiencing the historic town of Hahndorf, an easy 25-minute drive from Adelaide along the South Eastern Freeway. Recognised as Australia’s oldest surviving German settlement, this charming town transports you back to a culture and time when life was focused around growing produce, grazing cattle and building strong families. 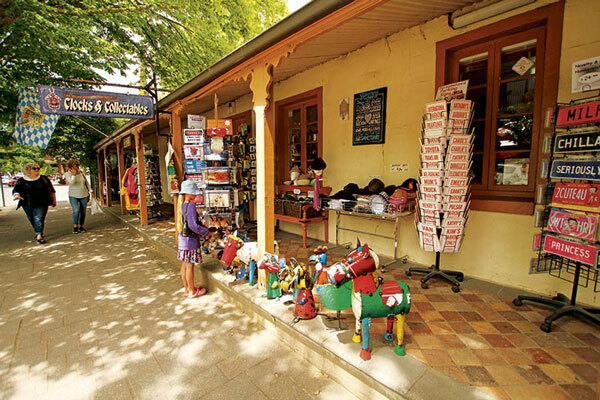 Hahndorf’s German history dates back to 1839 when the first German Lutheran immigrants arrived from the eastern provinces of Prussia to escape religious persecution. Thirty-eight families made the crossing aboard the ship Zebra, which was skippered by Captain Dirk Hahn. Fourteen additional families joined to bring the number of pioneering families to 52, which is reflected in the 52 majestic elm trees that were planted to honour these brave men, women and children. Their names are also inscribed on the gates of the Pioneer Memorial Gardens in Hahndorf. 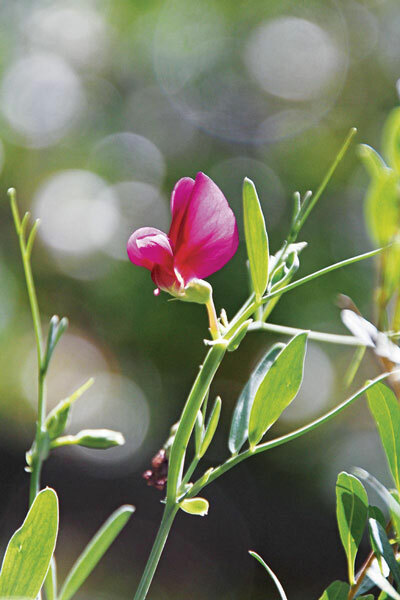 Captain Hahn assisted the immigrants to obtain 100 acres of bushland rent-free for the first year, enabling them to make a new start in Australia. The settlers rewarded their helpful captain by naming the town ‘Hahndorf,’ which translates to ‘Hahn’s Town’. The town still retains its village feel and many of the original buildings have been restored to their former glory. The characteristic Germanic ‘fachwerk’ (half-timbering) of the houses adds to the town’s unique appeal and is considered some of the best examples of this type of construction in Australia. 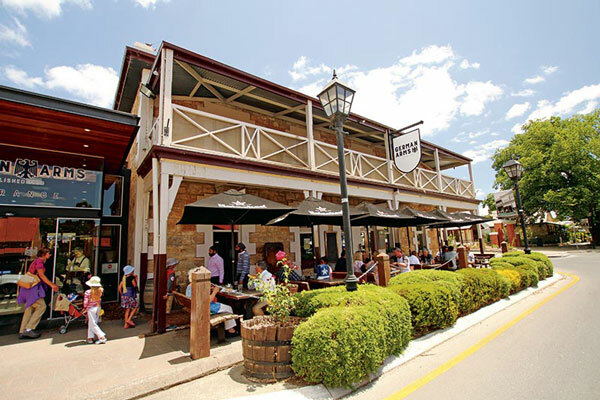 A visit to Hahndorf must include a lunch or dinner to enjoy a traditional German meal, such as bratwurst and sauerkraut. If you’re more of a sweet tooth, try the German bee sting cake, which is bound to have you coming back for more. 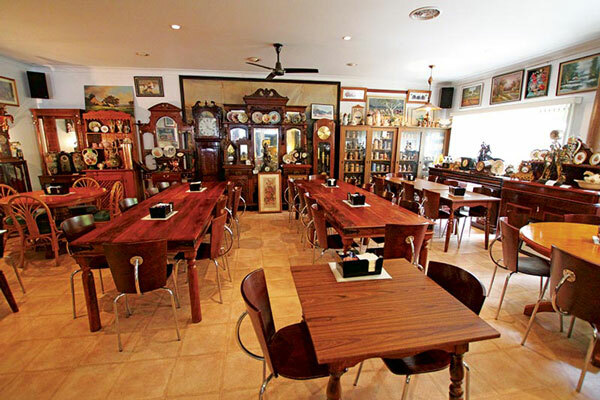 Don’t pass by the Hahndorf Inn without having a look inside. Established in 1863, the hotel has retained many of its original features. The German Arms Hotel, dating back to 1839, is famous for its variety of imported German and Bavarian beers. You can easily spend a few hours or even a full day wandering the town’s charming streets. 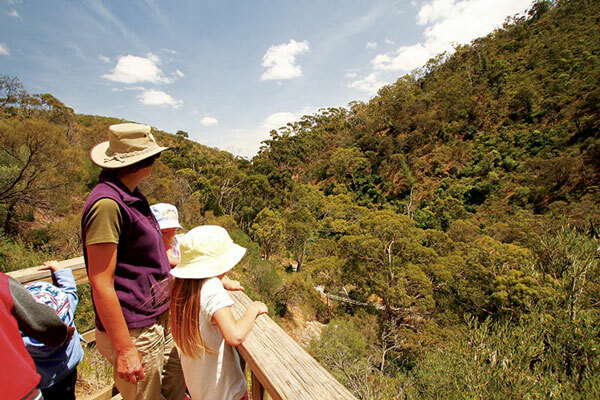 Aside from memorable historic towns, the Adelaide Hills also boast a vast array of natural sights and attractions. 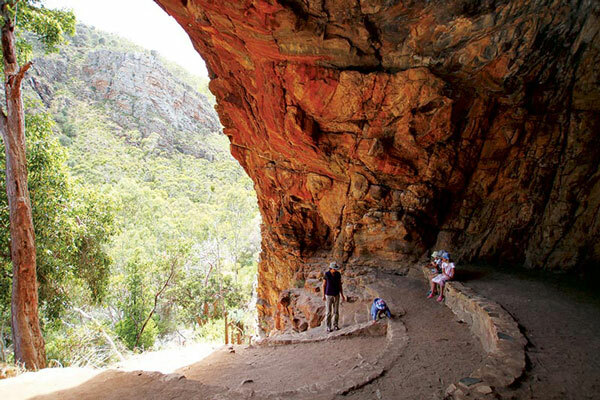 Morialta Conservation Park is a small area of spectacular beauty, just 10km from Adelaide’s CBD. Celebrating its 100-year anniversary in 2015, the park is home to a large number of walking trails and three seasonal waterfalls. Rock climbing is a popular activity, rewarding climbers with views of the breathtaking Morialta Gorge and the Adelaide Plains. We ventured out to the park on a warm spring morning to take the kids on the First Falls Valley Walk. 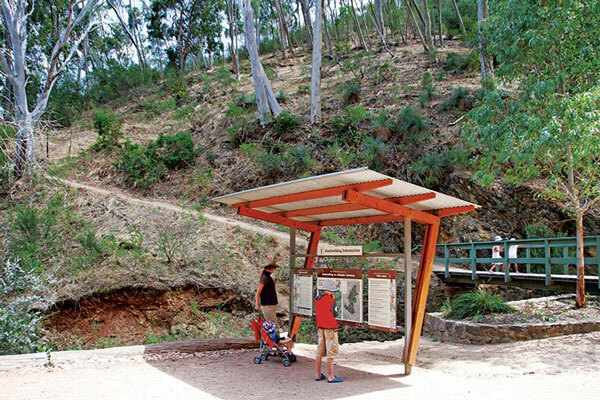 The 1.6km return walk is graded as easy and is suitable for families with young kids and prams. Heading into the gorge, I found the park strikingly similar to the Grampians in south-west Victoria. Steep ridges and impressive rock formations dazzle you on every side. After a 20-minute walk we came to the waterfall which, unfortunately, was down to just a trickle due to the early arrival of hot weather and little rain. On the return walk, the kids raced up the 60 steps to Giants Cave, which rewards with fantastic views of this breathtaking area. Our second visit to the Adelaide Hills turned out to be as memorable as the first one and we’re already talking about going back. 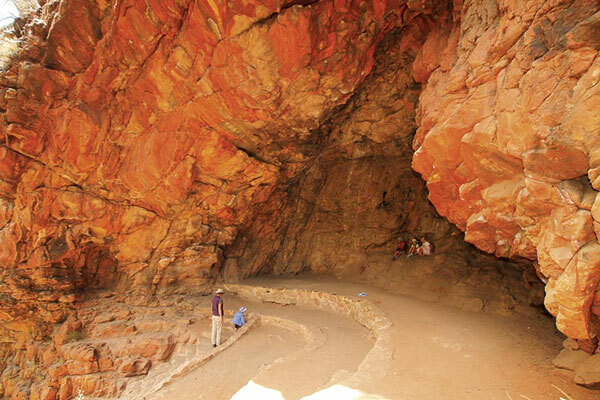 This unique region of South Australia has a charm that is bound to capture your heart, just like it did ours. The Adelaide Hills, part of the Mount Lofty Ranges, are situated east of the city of Adelaide. Enjoy breathtaking scenery from the Mount Lofty Summit. 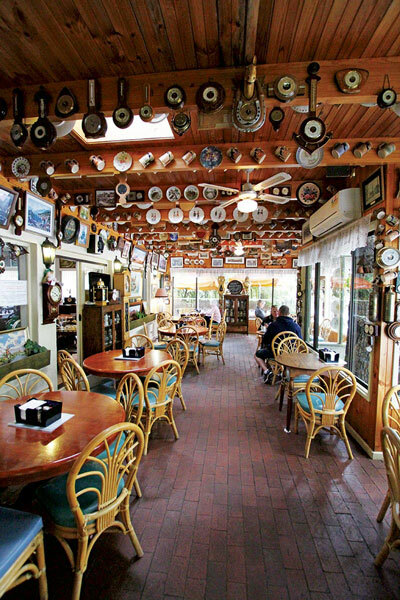 Explore the historic town of Hahndorf and eat your fill of German sausages and cakes. 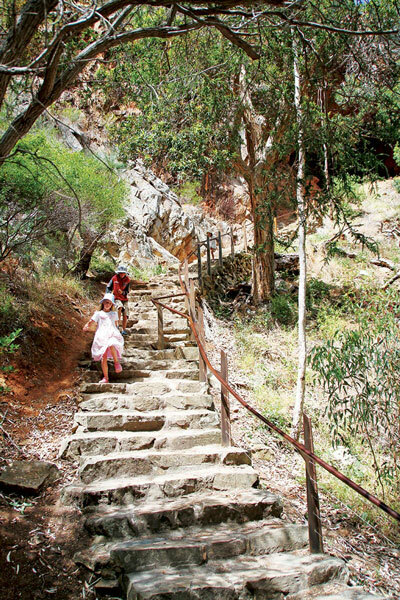 Take a walk in the small but impressive Morialta Conservation Park.